June 1942. "Florence, Alabama, Saturday afternoon." View full size. Medium format negative by Arthur Rothstein for the Farm Security Administration. Submitted by Smoothcat on Mon, 05/09/2011 - 3:54pm. This is the corner of Court and Mobile in downtown Florence. The camera seems to be perched in the old Rogers Department Store building. The modern Street View image is sadly not as interesting, though the City Cafe building and the building just to its left are both still standing today. I was born and raised in Florence. It's a great place to live, and downtown has fared a lot better than many cities its size. Submitted by Patrick Seth on Tue, 05/19/2009 - 6:54pm. I'm looking for an old pic of THIS area right here, only its older (I'd say late 1800's) it's b/w and shows horse troughs on the ground below where traffic lights now hang. Tennessee / Court street. Anyone know about it? Submitted by Florenceman on Mon, 05/18/2009 - 7:08am. I wish it looked that good today! I live less than a mile from where this was taken. 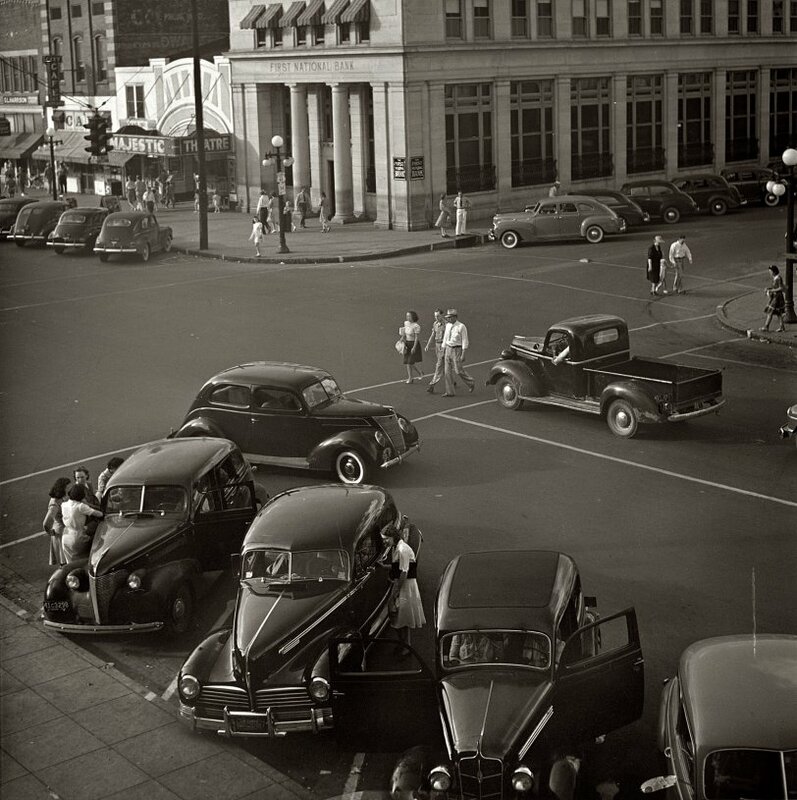 I would love to see that many people walking and socializing on the sidewalks again. Submitted by Anonymous Tipster on Sat, 09/06/2008 - 6:49am. This is my hometown and the hometown of my parents and grandparents. This picture had to have been taken from the old courthouse, which is long gone, but the buildings in the picture still exist! Submitted by Harry DeGeorge on Fri, 07/25/2008 - 11:52am. A much simpler time, what a fantastic picture. It could be a Norman Rockwell painting. Submitted by Bruce Trainor on Wed, 03/12/2008 - 7:06pm. Even though WW II was raging, the picture show a gentle perhaps kinder time. People socializing, cars washed, traffic rules obeyed, clean streets, just great. Where did it all go? Submitted by bellhalla on Sat, 03/08/2008 - 9:49am. My grandmother gave me a cast iron skillet (that had been her mother’s) that was made in Florence. Some of her family had moved from that area in the 1850s, and I’ve always wondered if that skillet is that old or not. Whatever the case, I made some cornbread in it the other night, so it's still working fine, however old it is. Submitted by Brent on Fri, 03/07/2008 - 10:31am. It seems to me that a 1942 Hudson would be a relatively rare beast. I realize that production and sales on the 1942s started in September 1941, but they'd still have a shortened production run once the government ordered a halt to new automotive production because of the war. Submitted by Anonymous Tipster on Fri, 03/07/2008 - 8:48am. Isn't this great? Women wore skirts, and you could drive a car called Hudson. Submitted by GERRY WITH A G on Thu, 03/06/2008 - 11:06pm. The Hudson in the center of the photo is a 1945 or 1946. Submitted by Foy Blackmon on Thu, 03/06/2008 - 9:39pm. Wonderful scan . . .Bravo! Submitted by RV Droz on Thu, 03/06/2008 - 1:37pm. The Majestic opened Saturday, August 30, 1919, at 204 North Court Street next to the new First National Bank. It's not clear what was shown on opening day, but the primary advertisements announced a Paramount Artcraft Special -- a motion picture style show with living models called "That Well Dressed Look" for September 1 and 2. The theater seated 400. The last night of business seems to have been June 9, 1951. Submitted by Richmonder on Thu, 03/06/2008 - 1:20pm. Traffic lights sure have become more elaborate since then. You would have trouble getting such a clear shot at a big intersection like that these days without a bunch of poles and signals getting in your way. Submitted by Bombay Scottie on Thu, 03/06/2008 - 11:06am. I love all the detail. It makes me wonder where everybody in the pic is today? Wonder where they were going? Love the contrast!